30 LC DBM Industry Best Practices According to home improvement website TheSpruce. com, the minimum amount of tread depth should not be less than 10 inches; the maximum amount of rise should not exceed 7.75 inches and the width should be at least 36 inches. It is not explicitly required to incorporate overhang - ing treads, although the best measurement for each stair over hanging a riser is about ½" and ought to remain uni - form throughout the entire staircase. DIYnetwork.com says that the formula for the ideal re - lationship between rise and run is "Twice the rise plus the run should equal 25 inches to 27 inches. Although, each state has building code regulations that must be adhered to when constructing private or public sets of stairs. The Building Stone Institute states, "Important consider - ations for selecting stone for this type of work are: surface finish, resistance to wear, slip resistance, resistance to stain - ing, and maintenance. The use of porous limestones and soft, (clay-rich) sandstones is not recommended. 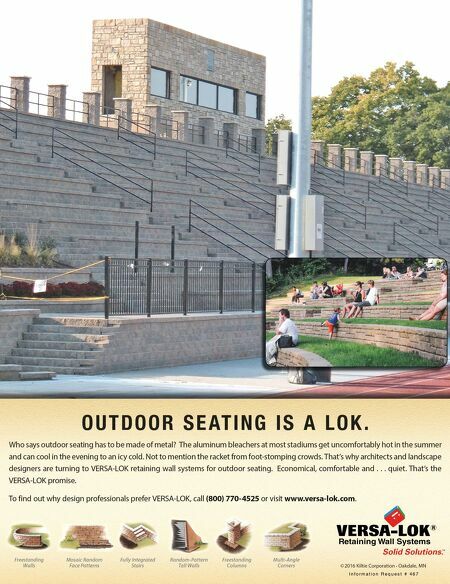 High traffic areas require less porous, harder stones as these are more resistant to staining and wear." Though DeFranco used blusestone in the Lake George project, which is a recommended material, he says he typically chooses granite because it holds up even better against the elements. His company sometimes pours concrete steps and has installed precast, reinforced concrete stones from various manufacturers. DeFranco offers a word of caution though. "Sometimes the rebar and wire mesh don't have enough cov - erage and you can get rust spots. I think it is a rare occurrence but it is something to look for. When you get materials delivered to a jobsite from a manufacturer or dealer, you really want to inspect closely because anything that is chipped or slightly dam - aged is where you are prone to see these spots." The project was completed in the summer of 2017 with the hydroseeding and sodding of the lawn areas. That year, DeFran - co Landscaping and his consulting engineering business were awarded the Irving Langmuir Award, which is given by The Fund for Lake George for excellence in development and stew - ardship: recognizing DeFranco's dedication to protecting the lake by implementing low-impact development practices. 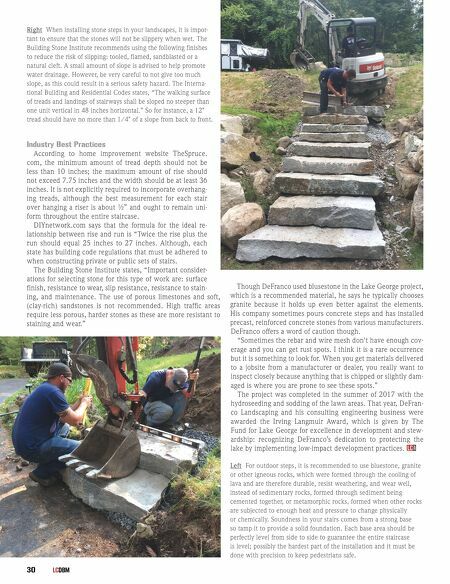 LC DBM Right When installing stone steps in your landscapes, it is impor- tant to ensure that the stones will not be slippery when wet. The Building Stone Institute recommends using the following finishes to reduce the risk of slipping: tooled, flamed, sandblasted or a natural cleft. A small amount of slope is advised to help promote water drainage. However, be very careful to not give too much slope, as this could result in a serious safety hazard. The Interna- tional Building and Residential Codes states, "The walking surface of treads and landings of stairways shall be sloped no steeper than one unit vertical in 48 inches horizontal." So for instance, a 12" tread should have no more than 1/4" of a slope from back to front. Left For outdoor steps, it is recommended to use bluestone, granite or other igneous rocks, which were formed through the cooling of lava and are therefore durable, resist weathering, and wear well, instead of sedimentary rocks, formed through sediment being cemented together, or metamorphic rocks, formed when other rocks are subjected to enough heat and pressure to change physically or chemically. Soundness in your stairs comes from a strong base so tamp it to provide a solid foundation. Each base area should be perfectly level from side to side to guarantee the entire staircase is level; possibly the hardest part of the installation and it must be done with precision to keep pedestrians safe.